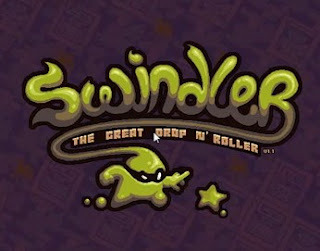 Swindler The Great Drop n Roller is a new physics based platformer puzzle game developed by nitrome. Complete levels by dropping, tangling and rolling your way through a great puzzle filled adventure. You are green ninja like creature whose objective is to collect stars by swinging onto them using your rope. Avoid yellow substances, they are dangerous to the health of green ninja like creatures.